This black bean burger recipe was basically gleaned from the Vibrant Life magazine, which I subscribe to. I love their short, insightful health articles and their healthful recipes I get every two months. The picture of above was my lunch, and I enjoyed really enjoyed my lunch. I’ve let others taste the black bean burgers, and they’ve liked them as well. Turn oven onto 350F. Wash brown rice and place in a pyrex dish. Boil water in a pot. Place water in pyrex dish and cover the dish with aluminum foil. Place in oven for 1 hour. This yields approximately 2 cups of brown rice. If your rice is too fluffy, it will be harder to have a firm burger. ***These burgers might need more salt depending on if you’re not using salted canned beans and your rice is not salted. Smoked paprika is made form dried smoked red bell peppers. It has the same smoky flavor as chipotle, but without the heat. Heat water in skillet over medium heat (if pan is cast iron, reduce heat to medium-low). Add onion, bell pepper, and salt. Cook, stirring occasionally, until onion and pepper are soft. Continue to cook, until onions start to caramelize, about 10-15 minutes. Remove from heat. Heat oven to 350F. Measure out 1/2 cup black beans and set aside. Place remaining beans in mixing bowl and mash. Stir in rice, corn flour, pumpkin seeds, cumin, coriander, and smoked paprika. Stir in reserved beans and cooked onion and pepper. Let stand 5 minutes. Use 1/2 cup of mixture for each burger and form into 6 large burgers. Bake 30 minutes or until lightly browned on bottom. Turn burgers over and bake for another 20-30 minutes or until they’re done. Note: The speed at which the burgers will be done depends on your oven and where you place the burgers inside the oven. If you’re making a multiple batches of them, some burgers probably will be ready before others if you don’t use a convection oven. Make sure you check on your burgers while they’re in the oven, and also, in the middle of cooking, change their location in the oven so they can cook more evenly. 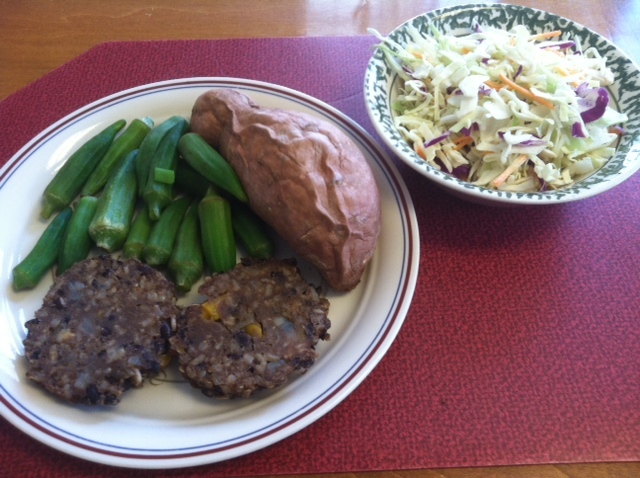 Six ½ cup black bean burgers.